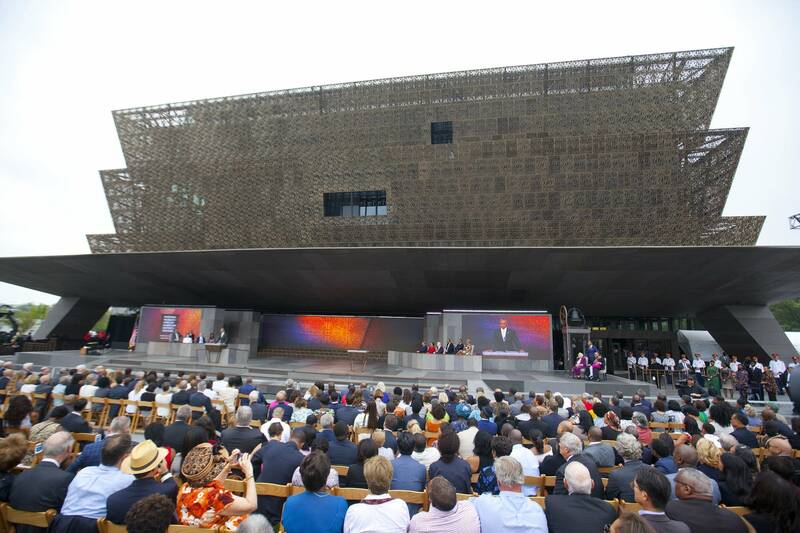 The Smithsonian Institution's National Museum of African American History and Culture has opened up a world of stories that visitors are flocking to discover. Before its September 2016 opening, the Washington Post asked people across the country to submit photographs of family objects that connect them personally to black history. The Post, along with APM Reports, produced a podcast called "Historically Black"that put a spotlight on some of the many items, and the stories behind them. The first object is a photograph of Miriam Daniel Mann walking down the street in Hampton, Va., on her way to Langley Airfield where she worked as a human computer in 1943. Mann was one of a handful of African American women who were recruited by the government to work on top-secret aircraft designs during World War II. Their calculations were used to help win the war — and later, get America to the moon. "A human computer was a person that computed the math for the engineers, and they had a No. 2 yellow pencil and a slide rule — that was it," said Miriam Harris, Mann's daughter. Normally, computing was considered menial work, reserved for white women. However, in light of a severe labor shortage, the jobs were opened up to educated African American women as well. At the time Virginia was still a very segregated state and offices, eating spaces and even bathrooms were labeled for where the African American women should go. "Over in the corner they had this big round table with a sign on it that said 'colored computers'," Harris said. "And my mother proceeded to take the sign off the table and bring it home." Mann did this with several of the other signs until permanent ones were put in place. When Mann's husband warned her she could get fired for the behavior she responded "At least I'll go down fighting," said Harris. It was acknowledged, albeit very quietly, that without the help of these human computers WWII may not have been won. By the 1960s Mann and the other African-American women at NASA were working in the same office as their white colleagues — the signs were taken down too. The second object is a photo of the Million Man March, submitted by Kamille Washington whose father, B.T. Washington, attended the march in 1995. "I don't remember my dad going to the march," Washington said. "But I do remember the care with which he had the poster framed, and had it hung in this place of prominence in his den." Gazing at the poster over the years, Kamille began to understand that his participation in the Million Man March had changed her father's life. "It was a spirit of jubilation, everybody was just happy, you know, everybody was just speaking to each other talking to each other about where they were from," B.T. said. It was all about brotherhood, he recalled. "It was about not doing certain things to people, especially your own people." But the most important thing he learned at the march, B.T. said, was that outside the military where he worked there were, in fact, many professional African-American men in a wide variety of fields. He had been brainwashed to think African-American men couldn't be smart enough to work any job they wanted — seeing proof that that wasn't true had a huge impact on the rest of his life, B.T. said. The third item is a photo by James Van Der Zee, an inventive photographer in New York, who by the end of his life was regarded as the most important photographer of his time. The photo was taken in the 1930s, showing a fashionably dressed, young African-American man. In the early 30s a new wave of African-American art, literature and music swept the big cities of northern states as people left the south to escape oppressive Jim Crow laws. Zee was at the heart of this wave, documenting history as the voyaging African-Americans transitioned from the rural to urban environment. The glamorous, dignified shots worked in sharp defiance to the racist caricatures of African-Americans that were still used as daily entertainment for white people across the country. To listen to the entire program, click the audio player above. Check back next week for part two of "Historically Black"